Members of Greater Napanee Emergency Services practice an ice water rescue on the Napanee River on Sunday morning. GNES staff are anticipating a busy winter as the weather has been unpredictable thus far, leading to unstable ice throughout the region. Photo by Adam Prudhomme. 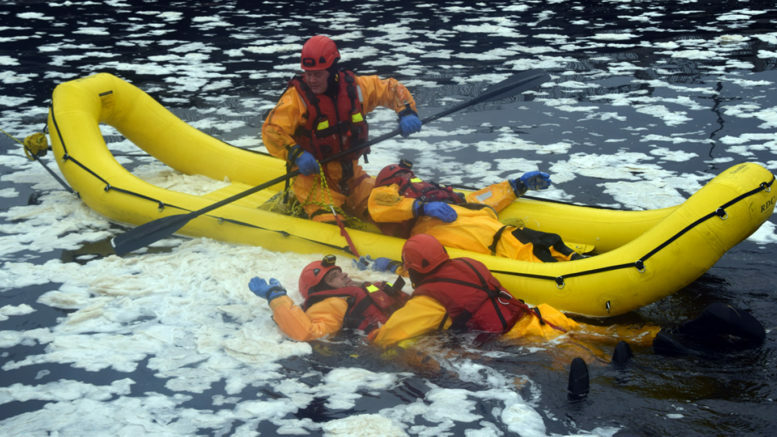 Greater Napanee Emergency Service (GNES) members plunged into the icy waters of the Napanee River this weekend, training for various water rescues they may have to perform this winter. Though not quite frozen over firefighters dressed in full water-gear used the water at the Centre Street boat launch for a series of training drills, held Saturday and Sunday. The temperature hung around the freezing mark with large chunks of ice floating in the water. “What we’re doing today is considered a cold water rescue, in an open water environment,” explained GNES deputy fire chief Bill Hammond. That exercise required one member of the team to play the role of a patient, lying on a piece of ice or in the open water while another member jumped into the water and swam out to the member pretending to be in danger. As part of the exercise, each member of the crew had the chance to be the rescuer and rescuee. The second drill involved the use of a Fortuna boat. Those in the boat had to deal with the challenge of rowing through chunks of ice to reach the members in the water. Jumping into the water is seen as a last resort for the firefighters, but one they need to be prepared to do on any water rescue call. Before getting into the water, each GNES firefighter had to do two weeks of classroom training, studying theory, hydrology and learning about ice forms and what to look for when determining the strength of an ice surface. All told about 33 members of the team will be certified to take part in an ice water rescue following the intense training session. Hammond says they’ve already had to stage a handful of actual ice water rescues within the last calendar year and expect to see more in the coming months.